Although zucchini can grow almost 3 feet long, look for small ones between 6 and 8 inches in length which will prove to be more sweet and tender. The rind should be easy to pierce and the squash should feel firm and heavy for its size. Zucchini can be stored in the refrigerator for 3 to 4 days. Before cooking zucchini, rinse, trim and slice or halve it; do not peel it unless the recipe requires it. 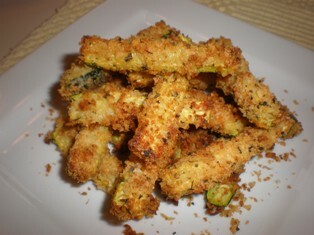 Although these are called zucchini fries they are actually baked. You can use regular dried bread crumbs in place of the Panko crumbs but the Panko adds some extra crispness. Serve these as a side dish or as an appetizer with marinara sauce for dipping. Lightly grease 2 baking sheets with cooking spray. Cut the zucchini into sticks, approx. 3-inches long x 1/2-inch thick. In a shallow bowl, combine the panko, Parmesan, basil, oregano, cayenne, salt and pepper. In another bowl, lightly beat the eggs. Dip the zucchini sticks in the eggs and then in the breadcrumb mixture. Arrange the coated zucchini in a single layer on the prepared baking sheets. Don’t crowd them or they won’t brown well. Lightly spray the zucchini sticks with cooking spray. Bake 20 minutes, or until golden brown and crisp. Remove from the oven and immediately season with salt. Serve hot. Sauteed zucchini goes well with any of our classic chicken dishes or boneless chicken breast recipes. Heat olive oil in a skillet over medium-high heat. Add the zucchini, onion, and red pepper flakes. Saute 4 to 5 minutes, or until the zucchini is just beginning to brown. Add the garlic, salt, and pepper. Saute for 1 more minute. Remove the skillet from the heat and stir in the tomato sauce. Serve. 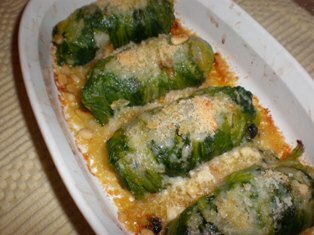 This gratin is nice with grilled meat or fish; served hot or at room temperature. Heat 2 tablespoons of olive oil in a skillet over medium-low heat. Add the onions and garlic; sauté until golden, about 10 minutes. Season with salt and pepper. Preheat oven to 375 degrees F. Grease a 13 x 9 x 2-inch baking dish. Spread the onion mixture in the baking dish. Scatter a little of the thyme over the onions. Arrange the zucchini and tomatoes in overlapping slices over the onions. Sprinkle wit the remaining thyme; season with salt and pepper. Drizzle with the remaining olive oil. Bake 40 to 45 minutes or until the vegetables are tender and juices are bubbling. Sprinkle with the Parmesan and bake until slightly melted, about 5 minutes more. Allow to rest 10 minutes before serving. In a bowl, combine all the ingredients except the oil. Stir to blend the ingredients well. Drop about 2 tablespoons of the zucchini mixture into the oil for each pancake. Flatten each mound to an even thickness about 3-inches in diameter. Saute each pancake until browned on each side, 2-3 minutes per side. Transfer to a paper-towel lined plate to drain. Serve hot. This is a great dish for people on a gluten-free diet. Try if with a mixture of zucchini and yellow crookneck squash. You can also add some sautéed mushrooms or shredded, cooked chicken to the dish. 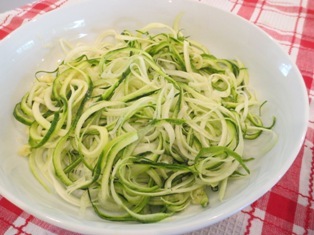 Cut the zucchini into very thin lengthwise strips (use a mandolin, if possible). Cut the strips into noodle-like widths. Heat butter or oil in a large skillet over medium high heat. Add zucchini and garlic; cook and stir until just tender, about 5 minutes. Season to taste with salt and pepper. Sprinkle with Parmesan cheese. No more bending your spaghetti or lasagna to get it all in the boiling water. WHAT KNIVES ARE ESSENTIAL FOR A BASIC KITCHEN? This small knife is great for detail work like deveining shrimp, hulling strawberries or other tasks for which you need the precision of a short blade and a sharp point. You can accomplish most cooking tasks with three basic knives. Invest in a quality brand and they will last you for years. The sawtooth edge is essential for bread and bagels and slicing tomatoes. It's also perfect for cutting cake layers. This sturdy knife is good for jobs of any size ... from mincing garlic, chopping vegetables, to carving a roast. By one that feels comfortable in your hand with an 8- or 10-inch blade. From Prosecco to Chianti, Viva Italia combines six bottles representing the best wine growing regions and varieties of Italy. A diverse collection for the Italian wine lover.